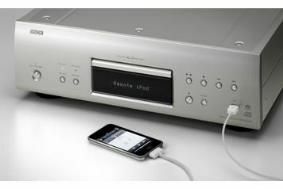 Denon adds high-end stereo SACD player and amp | What Hi-Fi? The amplifier is said to "draw on nearly 100 years of Denon engineering experience', while the player "is endowed with unique technologies to ensure that the sound of various sources is played more faithfully than ever to the original recording." The DCD-2010AE uses a new direct-drive Advanced SVH Mechanism designed with a low centre of gravity and an anti-vibration die-cast aluminium loader, and is built on a triple-layer base for mechanical isolation. A new version of Denon's AL32 digital signal processing is used, along with 32-bit/192kHz digital to analogue converters, and the player has both optical and electrical digital inputs and a USB with iPod Direct Connection, allowing external digital devices to be played through the DACs. The circuitry has been designed with minimal signal paths, and there are separate power supplies for the analogue and digital sections. The amplifier is a 80Wpc design, also built on a vibration-killing chassis and using the company's UHC-MOS Single Push-Pull output circuitry. Twin transformers are used, in mounts designed to cancel out any leakage, signal paths are kept as short as possible and Denon's Precision Signal Ground Circuit aids signal purity. It has seven inputs including a high-quality phono section, and like the player comes complete with remote control.